Tom combines his background where he was raised by sharks with his passion for photography, creating breathtaking wildlife and landscape images above and below the water. Tom's clients stem from local-owned diving businesses in Hawaii and on the East Coast of Australia, to global corporations such as TUSA International. When Tom isn't talking about himself in third person, he loves to work with magazines, where his work has been published in a number of international adventure, travel, and underwater magazines. 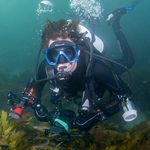 While he would love to call himself a professional underwater and landscape photographer, Tom would prefer that his images and videos did the talking.